I am always searching for ways to spice up regular meals. For me during pregnancy eggs have been a staple for breakfast or lunch. They can get really boring sometimes, especially when it becomes an everyday occurrence. I am also a huge fan of salsa. One day I was craving both! I thought hey why not combine the two! I was thoroughly impressed with what I can up with. Still simple yet full of flavor. You could chose this for breakfast, lunch or dinner…it is truly filling. It is a Simple, easy and Tasty addition to a boring everyday meal. Not to mention it adds a bit of the rainbow to your meal, always a plus! Enjoy! Recipe is below, Here is a Video tutorial too! 1. First chop up your onion and tomato. Then throw them into a small bowl. 2. Slice open that avocado and pull one half out of the outer shell. I absolutely love my avocado tool, you can find it here! Add avocado to your bowl of onion and tomato. 3. Add 1 TBSP Cilantro and squeeze one lime wedge on mixture. 4. Mix together and then set to the side. 5. Cook your eggs, I scrabbled mine. You can cook them however you prefer. 6. Once eggs are cooked add them to your bowl and mix into salsa. 7. 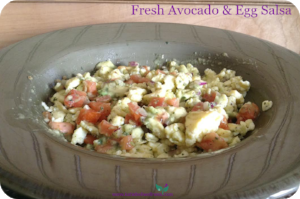 Viola, your Fresh Egg Salsa! Copyright © 2017 high vibe goddess & katie bock. All Rights Reserved.